Joegaetang is a refreshing stew made with fresh clams and assortment of vegetables in a mild broth. It contains a generous portion of little neck clam (including shells) with soybean sprout, tofu, and hot peppers. Red chili pepper powder can be added for additional seasoning in spice. 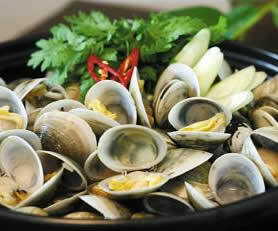 This is a popular dish found in Korean bars and restaurants which is enjoyed while drinking soju. It is usually served hot on a portable butane gas or jelly burners.